Asheville's Favorite Pet Store! Patton Avenue Pet Company is known in our community as a pet store that cares deeply about your pets well-being. They have partnered with us to support the pets and people in our community. Patton Avenue Pet Company also supports us with their 10-10-10 Program. New adopters receive 10% off their purchase for 10 days after the adoption of their new pet from Mountain Pet Rescue Asheville. AND 10% of their purchase is donated to Mountain Pet Rescue Asheville! Every dog needs a tag to help them find their way home. 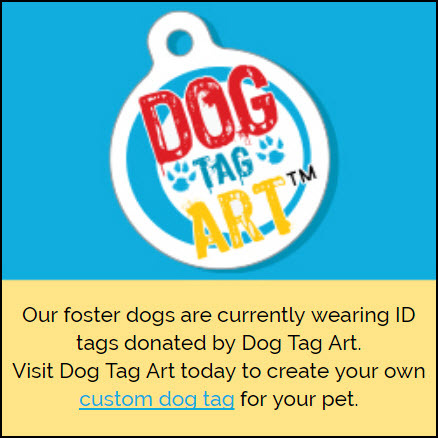 Our foster dog tags are made by our local partner Dog Tag Art. Banner Buzz helps non-profits get their message out! A huge thank you to them for their donation of a 4’x3’ banner for our events.